George W. Bush didn’t say this, I did. This is a visual representation of how I felt after responding to one of my students when asked about the number of Twitter followers I had. This past week in my Social Media Management class at Algonquin College, one of my PR students, @MunnaAden, asked a question I had not really thought about before. 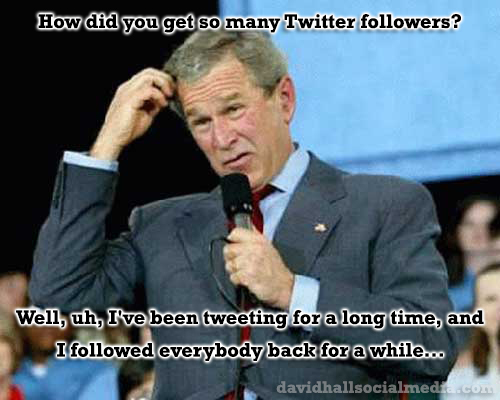 She queried, “How did you get so many followers?”. A great question, but I didn’t have an answer readily at hand, so I came up with the classic “well, uh, I’ve been tweeting for a long time (since 2008), and I followed everybody back for a while (which is a bad idea).” After reflecting on that class session, I felt that I really should have had a better answer. Although there’s no sure-fire way to guarantee twitter followers, here are a few things that I have done over the years that I think played a role in the amount of Twitter followers I have. The content I share focuses on only a few topics: Social media, communications, marketing, and education. Of course, these topics are complemented with some personal posts, or comments on the sports teams I root for, but for the vast majority of the time, you will be getting social media, communications, marketing, and education-themed tweets from @David_Hall. Try and think of your tweets as a service that you are providing to your readers, not an online platform for sharing every thought you have. The service you provide, just like any consumer service, should be focused, consistent, and predictable (to some degree). The longer you tweet about a certain suite of topics, the more followers you will get. I feel that the sheer length of time I have been tweeting about my topics has had a positive effect on followership. It’s a lot easier to get eyes on content shared from a mature account than to get eyes on a new twitter profile that only has a few dozen, or hundred, tweets. When I started tweeting, I was eager to see what other communicators were saying. Remember, this was back in 2008, so I was, like most people at the time, just trying to figure out exactly what the power of Twitter was. For each new marketing/PR/social media professional I followed, I gained access to their content, which was often great for retweeting. This retweeting helped me because it notified the original tweet sender that I was listening to, and endorsed, what they tweeted by sharing it with my followers. Telling people you like their content is a good way to make friends, and it can often result in a follow from the retweeted account. Retweeting great content from other accounts also helped my own Twitter presence because it gave me more great content on my account. It’s a self-reinforcing circle. This one is a bit contentious, and I do not recommend it. When I first started on Twitter, I thought it would be a courtesy to follow-back any account that followed me. I thought of it as a nice little digital-hug while saying “thanks for following”. This didn’t turn out so well for me. Over the years, I have now followed or followed-back several thousands of users. As a result, my home feed is virtually useless. I now have to manage my twitter feeds through lists and keyword searches in Hootsuite to make sure I see what I want to see. This, however, ruins some of the serendipitous content discovery that I love about Twitter. I do, however, believe that all this following on my behalf made me a great target for those looking for follow-back, meaning that the main reason they followed me in the first place was in the hopes that I would follow them back. I can’t say for sure, but I would wager that some of my followers would fall into this category. Lessons learned: Don’t just follow back because you think it’s a nice gesture; your home-feed will be shot. If you want to be a successful content creator, you should start by curating some great content first. Content curation becomes easier when you have purposefully done step 2 on this post. The idea goes, if you follow people who share good content, you have a virtually endless stream of relevant and shareable content delivered directly to your home feed. Simply curating retweets won’t get you all the curated content you need, so I also have a few go-to resources when I need to find good content to share: Social Media Today, Social Media Examiner, Mashable (less so lately), Tech Crunch, PR Daily, AdWeek, The Chronicle of Higher Education, Academica, etc. Just find some blogs and newsletters you like to read and share their content. This is the most important step. My Twitter following didn’t really start to grow rapidly until I started this blog. I consistently created weekly content for a few years, and over that time my blog and Twitter popularity grew. Along with this weekly content creation, I also did an hour-long podcast for about 18 months focusing on social media and technology. I found that once I started creating, people really started to take notice and began to follow my account in higher numbers. Munna, I hope this does a better job answering the great question you asked in class last week. @David_Hall my question was answered perfectly so thank you for that! you’re in reality a good webmaster. The website loading pace is amazing. you’ve performed a great job on this subject!